This house was originally built in 1902 by Marshall (Mont) Fulford for his aunt, Alicia Halloran. Halloran, the sister of Sarah Jane Fulford, was a widow who moved to Eagle from Nebraska in 1901.his house was originally built in 1902 by Marshall (Mont) Fulford for his aunt, Alicia Halloran. 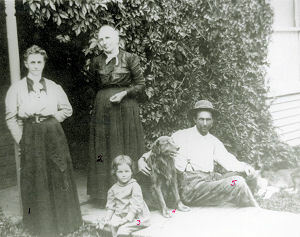 Halloran, the sister of Sarah Jane Fulford, was a widow who moved to Eagle from Nebraska in 1901. Telephone service arrived in Eagle about the same time as Halloran. Eagle Valley Telephone first provided the town with a telephone system and a switchboard was placed in Halloran’s house and she was hired as the telephone operator. By working the plugs and wires from a central switchboard, the operator put callers in touch with one another. There were about 10 lines in town, and each line had an assigned sequence of six to 10 rings. People using the phone in their homes counted a pattern of short and long rings to determine if the call was for them. By the 1920s, the system had 75-100 customers. elephone service arrived in Eagle about the same time as Halloran. Eagle Valley Telephone first provided the town with a telephone system and a switchboard was placed in Halloran’s house and she was hired as the telephone operator. By working the plugs and wires from a central switchboard, the operator put callers in touch with one another. There were about 10 lines in town, and each line had an assigned sequence of six to 10 rings. People using the phone in their homes counted a pattern of short and long rings to determine if the call was for them. By the 1920s, the system had 75-100 customers. When the phone would ring for one house, it would ring for everyone on the line. Although townspeople would never consider themselves snoops or gossips, they would get on the line and join in on the conversation. It was not unusual, after finishing a conversation with one person, for another person to come on the line to talk about something else. Halloran, known for her cheerful nature and strong religious beliefs, worked as the telephone operator for eight years, until health issues ended her employment. She died in 1913. She is shown standing in the middle of the group below. A series of phone operators followed Halloran, operating out of her one-time house which became known as the “telephone exchange.” This building served as the town’s telephone exchange for decades. 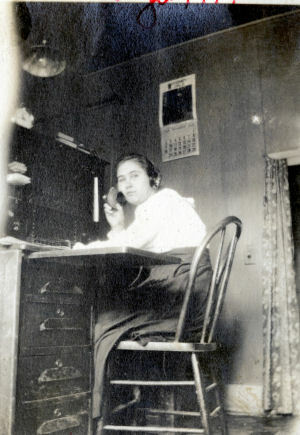 The telephone operator in the later years was Mabel Lanning, who had spent some time in the mining camp of Fulford. She chose not to live at the telephone exchange. When Mabel went home for the day, night operators would take over. Al Fulford was the lineman who kept the lines running. ​Although the system was antiquated by today’s cell phone standards, it had its advantages. Ranch wives on Brush Creek could ring Mabel at the exchange and request that she run into the pool hall down the street and send an errant husband home for supper. Mabel accommodated such requests. A typical switchboard operator is shown on the right. In 1948 the telephone exchange was moved from this building to another on the east side of Broadway. The telephone company had purchased a large, new modern switchboard. After the telephone company moved from the building it housed a number of businesses.